Domesticated salmon, after several generations, are fat, listless things that are good at putting on weight, not swimming up fast-moving rivers. When they get into a river and breed with wild fish, they can damage the wild fish's prospects of surviving to reproduce. In The End of the Line: How Overfishing is Changing the World and what We Eat (2004), 312. Fish farming, even with conventional techniques, changes fish within a few generations from an animal like a wild buffalo or a wildebeest to the equivalent of a domestic cow. 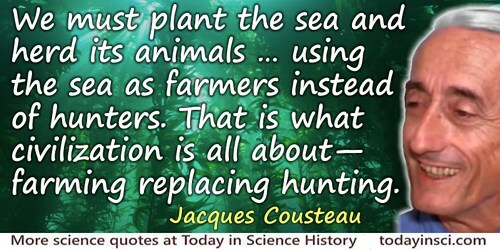 We must plant the sea and herd its animals … using the sea as farmers instead of hunters. That is what civilization is all about—farming replacing hunting. Epigraph for Robin Neill, 'Aquaculture Property Rights in Canada', in Nicholas Schneider (ed. ), A Breath of Fresh Air: The State of Environmental Policy in Canada (2008), 180.